In this circuit, we are going to use some of the lessons we learned in experiment 12 to control a relay. A relay is basically an electrically controlled mechanical switch. Inside that harmless looking plastic box is an electromagnet that, when it gets a jolt of energy, causes a switch to trip. 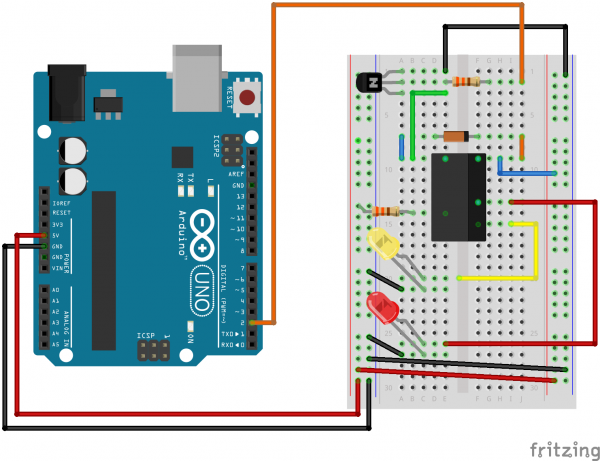 In this circuit, you’ll learn how to control a relay like a pro – giving your Arduino even more powerful abilities! 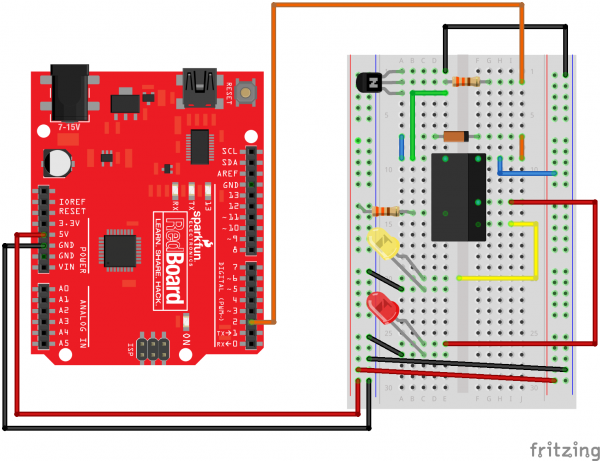 You will also need either a RedBoard or Arduino Uno R3. Ready to start hooking everything up? Check out the Fritzing diagram below, to see how everything is connected. Polarized Components Pay special attention to the component’s markings indicating how to place it on the breadboard. Polarized components can only be connected to a circuit in one direction. Having a hard time seeing the circuit? 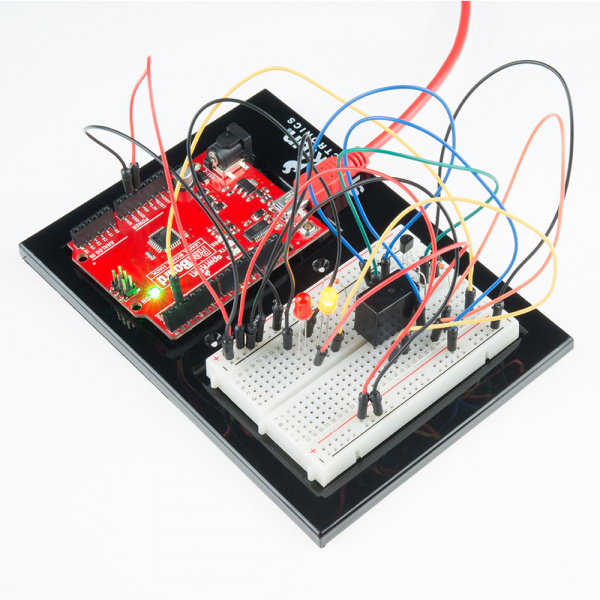 Click on the Fritzing diagram to see a bigger image. Open Up the Arduino IDE software on your computer. Coding in the Arduino language will control your circuit. Open the code for Circuit 13 by accessing the “SIK Guide Code” you downloaded and placed into your “Examples” folder earlier. You can also copy and paste the following code into the Arduino IDE. Hit upload, and see what happens! A relay is a electrically-controlled mechanical switch. the same way we used a transistor to drive a motor in circuit 12.
this if you already know how to safely work with high voltage!). and off for one second, the same as the blink sketch! the pins down, the order is COLLECTOR, BASE, EMITTER. Connect the BASE pin through a 330 Ohm resistor to digital pin 2. Connect the EMITTER pin to GND. a symbol indicating the coil pins. Connect other side of the coil to 5V. The relay has a coil that you energize to close the switch. protects the transistor from the voltage spike. can use them to switch almost anything on and off. Connect the COMMON side of the switch to a 330 Ohm resistor. Connect the other side of the above resistor to 5V. positive (longer) leg of LED 1.
positive (longer) leg of LED 2. Connect the negative sides (shorter leg) of both LEDs to GND. with lots of help from the Arduino community. This code is completely free for any use. Visit http://learn.sparkfun.com/products/2 for SIK information. 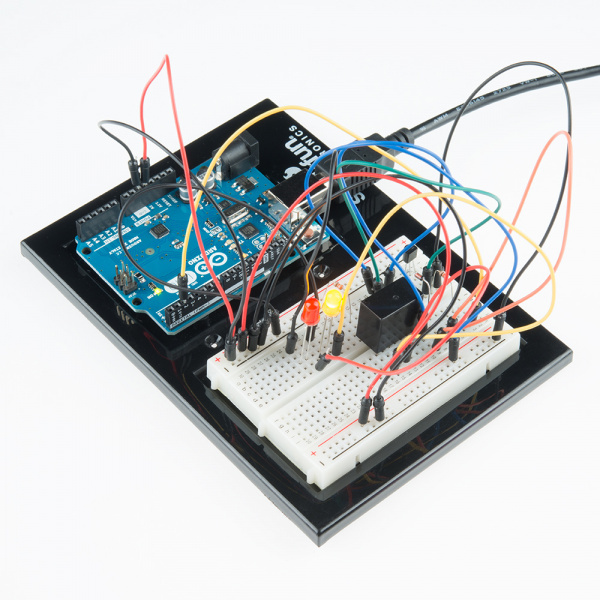 Visit http://www.arduino.cc to learn about the Arduino. The relay has an additional contact called NC (Normally Closed). The NC pin is connected to the COM pin when the relay is OFF. You can use either pin depending on whether something should be normally on or normally off. You can also use both pins to alternate power to two devices, much like railroad crossing warning lights. You should be able to hear the relay contacts click, and see the two LEDs alternate illuminating at 1-second intervals. If you don't, double-check that you have assembled the circuit correctly, and uploaded the correct sketch to the board. Also, see the troubleshooting section. Garage door openers use relays to operate. You might be able to hear the clicking if you listen closely. Double-check that you've plugged them in correctly. The longer lead (and non-flat edge of the plastic flange) is the positive lead. The transistor or coil portion of the circuit isn't quite working. Check the transistor is plugged in the right way. The included relays are designed to be soldered rather than used in a breadboard. As such you may need to press it in to ensure it works (and it may pop out occasionally). When you’re building the circuit be careful not to mix up the temperature sensor and the transistor, they’re almost identical.